Saturday was UK Government Barcamp day. A day of fast moving fun, filled with energetic and enthusiastic people who thought that giving up their weekend in the cause of better government was a sensible and desirable thing to do. There was a huge amount of energy on the day, represented and amplified in the twitter traffic (not far short of 2,000 tweets, and it hasn’t stopped yet) and a burst of blog posts appearing through Sunday and Monday, to say nothing of Paul Clarke’s pictures which, as usual, reveal an assorted gaggle of nerds, geeks and oddballs to be the heroes of our age. Let’s get the basics out of the way first. A barcamp – or unconference – starts with a blank agenda and invites the participants to suggest sessions. It’s one of those ideas which sounds utterly crazy until you try it, at which point it becomes apparent that it just works. So we started the day with forty potential sessions, and by the end of the day forty actual sessions had happened – with the complaints I heard all being about the agony of deciding between the eight sessions going on in any given time slot. That, by the way, has a consequence which is not always recognised – a choice of eight sessions, five times over gives 32,768 different combinations: it’s a fairly safe bet that, quite literally, no two people experienced the same event. Slightly to my own surprise – I hadn’t thought of it until 30 seconds before suggesting it – I proposed a session on how we connect the interaction layer to the transactional layer. It is getting that connection right which is often what actually gets things done for people and which is often (usually?) based on systems which so far pre-date Gov 2.0 that at a rough guess their age profile is not dissimilar to that of the people in the room on Saturday. It was a good, rich discussion, which really started to fly when Harry Metcalfe linked some of the issues we had been talking about to volunteered personal information and the power of user-controlled data and was boosted further by some splendidly provocative suggestions from Tom Steinberg and Simon Dickson. Better still, I was able to use one of those thoughts in a piece of work I did on Monday morning – though so thin an edge of the wedge that the crack created is probably not visible to the naked eye. So I can only put down to my natural perversity the fact that both that session and the equally challenging and creative discussion in Paul Clarke’s excellent session about how to experiment with innovation in the hardwired state left me feeling more than a little uneasy. It took me the best part of another day to work out why, and I am not sure that I have completely pinned it down even now. There was a fantastic group of people at barcamp. Energetic, passionate, generous with time and expertise, eager to make a difference, and in many cases a track record of creative difference making which I can only admire and envy. My guess is that the two biggest sub-tribes they fell into were those who weave applications out of data (often from outside government) and those whose trade is social media (often from a communications base and from inside public sector organisations). It was hugely refreshing and encouraging to spend time among people for whom the positive power of new media and new technology were recognised as a force for good and who were determined to make government work better, regardless of whether government showed any desire to be made to work better, and it is absolutely right – absolutely essential – that such a group re-energises and encourages itself. 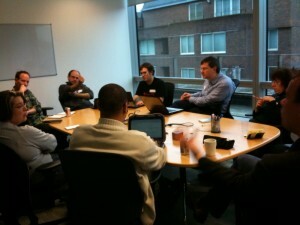 But in calling this event UK Government Barcamp a bigger and bolder ambition was being expressed than that. I can’t speak for local government – it’s not my background, and I didn’t go to any of the sessions specifically focused on local government issues – but central government was mostly not there. I found myself in several conversations being the closest thing there was to the voice of a policy civil servant, thought that’s not particularly what I think of myself as being (or what, I suspect, most of my policy colleagues would see me as being). I found my concerns about personal data and transactions and about government as service provider rather than information broker feeling a bit on the margin (and for more on the sorts of issues I am referring to here, see my recent post on Vogue and the welfare system, the posts linked from that one, and indeed this blog in general). None of that is to criticise the event which did happen. I found it stimulating, enjoyable, challenging – and reassuring. Those needs won’t go away. But satisfying just those needs also won’t bring this thinking into the mainstream and won’t unlock the radical and transformational force for good which it could have. So I think there is a choice to be made. I am sure there is a place for a UK Government Social Media Barcamp next year – I would sign up for it as I suspect would pretty much everybody who was there on Saturday. But is there also an appetite for something which is actually a UK Government Barcamp, accepting the breadth and implications that title implies? To do that would be both harder and easier than I suspect it looks. The easy bit first: I picked up a slight flavour from some that an unconference format wouldn’t work for a broader group and was a peculiarly geeky thing. That’s understandable given recent usage, but though the first barcamp happened only in 2005, the first unconference I went to was several years before that – and was made up of all the senior civil servants in the Cabinet Office. The atmosphere was remarkably similar with lots of energy, excitement and creative thinking, which is particularly impressive given that none of us knew what we were letting ourselves in for (and that participation was not exactly voluntary). But that same Cabinet Office conference also illustrates the hard bit. Few of the actions and conclusions survived the post-event energy sag, and it didn’t take long before the power of daily pressures and organisational structures reasserted themselves. Conferences – even unconferences – cannot exist in isolation from the world they are seeking to influence, the event itself can be only one part of a much bigger process. That should be much easier now than it was, because we have better tools and better awareness, but easier still means hard. The name change – from Barcampukgovweb to UKGovCamp wad deliberate on my part to try and drive some of the conversations away from being just about making government websites better and towards making government better. I dare say that webbishness would always prevail, not least because of the way the event was promoted. But half in my mind was what is going on in the States, where they seem to have been able to convene a large group of people around the Government 2.0 meme, which has failed to take off in the UK to the same extent – probably rightly – but the lack of an umbrella label, however meaningless, means it’s harder to drive the conversation forward collectively. Part of the issue I think comes down to what we were talking about in the session that wasn’t really about blogging. We need an ideas ecosystem in government, one where those with thoughts and ideas can express them without fear, and where a constructive conversation can happen around them. That might be online, it might be at future unconferences, it certainly ought to be happening inside departments and organisations – but I suspect it isn’t. One final point as I know I’m blathering on. It’s important not to load these events with too much significance. For the last two years when organising Govcamp, people have agonised over the invitation list, and desperately tried to think of ways to get policy-types (for want of a better term) to come along. Nobody has really even had a good idea for this, let alone put something into action. In the end, it turns into an opportunity for a group of people, most of whom already know and like each other, to get together and have a chat. There’s nothing wrong with that, of course, but no revolution will ever come of it. People looking for one will be disappointed. As ever, you crystallize my fuzzy issues much better than I could! Briggsy is right too, the event was very successful as a way of bringing together and energising the community and inspiring some fascinating and challenging discussions. But we then are left with the challenge of moving beyond social media into the mainstream policy development and delivery space. We also need to engage with my CIO colleagues as well, given that we have the capacity to be the biggest blockers of all. Though, interestingly enough we have been having very similar conversations in the CIO space about how we get that nebulous and unfortunate concept of “the business” to understand and engage with a changing world. 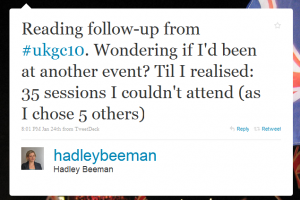 An excellent post and some great questions to think about in relation to future events. I suspect i’ll be shot down for this but i think the engagement of wider business/policy people will take some time and therefore it maybe a wise move if we encouraged more “topic specific” type conferences. One example of this is the internal comms event. That might if promoted correctly reach an audience not previously engaged. What we loose in this model is the cross fertilisation of ideas, but if it is done right you could allow space for others from outside the subject matter to get involved. I also think from a Local Government perspective that more regional based events might also help this approach. What i think we need to do is keep this conversation going and develop our thought over the coming months. Really great post. As this was my first ukgc it was really inspiring to see such a strong and proactive community dedicated to driving forward better digital solutions to public and government issues. One thought that stuck me on the participation debate however is that the strength of barcamps, and the reason they work, is the dynamism of the digital community that attend them. But this strength of community is also a barrier to broadening participation. In my experience, most policy people and government strategists are not digital natives. They are not active on twitter, and they wouldn’t join an open online network. By the time they hear about something like govcamp via their existing networks, the twitter buzz has already happened and the tickets have gone. The digital community are the first to hear about the event and the first to sign up and, as the participants define the barcamp agenda, the event becomes primarily a digital one. Which is not something most policy people are going to give up a Saturday for. If we want to broaden participation, the promotion of the event and ticketing needs to target people through a range of offline and online channels and networks that are relevant to the people we are seeking to engage. This is obviously trickier, but certainly not impossible – in central government at least there are plenty of existing networks we could tap into, depending on the topic. I know I’m prattling on a bit, but a final point is that highly participatory nature of the barcamp format holds massive possibilities for driving forward action on a huge range of issues – whether they have a digital element or not – and everyone I’ve ever spoken about them in central govt has been really intrigued and positive about the concept. With the right branding, promotion and attendance, barcamps could really move things forward. A great article but don’t under-estimate how far you’ve come or the significance of the achievements. Dave Briggs is right, don’t expect a revolution, but the attendees on Saturday show an increasing engagement from PS organisations. The fact that there weren’t many IT people from those organisations is also a good sign (initially at least). It’s up to all of us now to make sure that those around us understand why this is important and what they can do to help. To paraphrase a quote on the day – don’t wait to be asked, you need to go and make some of this happen _but_ try and bring the IT guys along for the ride with you. Trust me, they (mostly) want to help, it’s just that sometimes they aren’t equipped or empowered enough to make a difference – you can help with that too. As an observer 400 miles away who shamelessly “copied” Dave’s idea, the issue for me is how we turn the talk into action. It has only been when we have gone away, and built the applications, and opened them to the “market” that people have seen the chat become reality. I think that at barcamps, one is in listening mode. After, you sift and focus. Then you act and design a solution if you find a good idea and people you can work with. With money now a real issue, only those ideas with a business case will make it through. Everyone else in the public sector over the next 5 years is going to be extremely worried about their post.